Buying your compatible Lexmark 100XL Cyan Ink Cartridges for less has never been easier, with all our printer/inkjet supplies coming with free UK delivery. Nine out of ten customers receive their order the following day, meaning purchasing through us takes the hassle out of refilling your printers needs. All our compatible Lexmark 100XL Cyan Ink Cartridges go through an advanced clean and refill, so you can be sure they are not only compatible but will produce great results. Original authentic cartridges are used to help ensure consistent results at a discount. 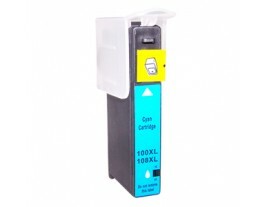 Suitable for a whole host of Lexmark printers/inkjets, each cartridge holds 11.5 millilitres of cyan ink.